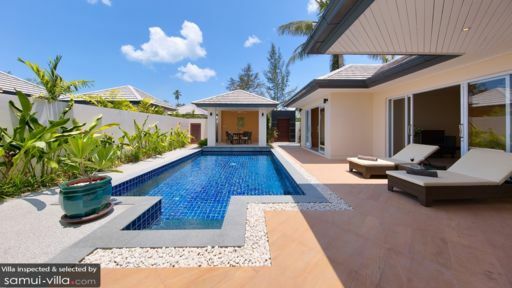 Villa Lipa Talay Sawng is a two bedroom haven by the beach, away from the bustle of the busier areas of the island of Koh Samui. It’s only a few steps away from Lipa Noi Beach while giving you the privacy and comfort of your own accommodations. With friendly helpful staff, spacious and comfortable guest bedrooms, and a cosy outdoor area, Villa Lipa Talay Sawng might be just the setting for your next best holiday. There are two guest bedrooms here at this villa in which you can rest and relax in after a fun day out. The two bedrooms are equipped with king size beds and spacious en suite bathrooms that are clean and have stone finishings as well as bright interiors. Each room also has a fan and air conditioning. Both also open up to the pool via glass sliding doors. This makes the space even more refreshing. The bedrooms also come with a flat screen TV, which is perfect if you want to have breakfast in bed while catching up on some TV shows. In Villa Lipa Talay Sawng, you can unwind in the blue pool, do some laps or float on your back and enjoying the blue sky above. You can also lay back on one of the two sunbeds by the pool deck if you want to lounge. The plants and trees in the villa’s garden liven up the space and provide a good view from the gazebo, where the four seater outdoor dining is. Here you can have dinners while enjoying the night air. It’s certainly a quiet and refreshing way to spend the evening. 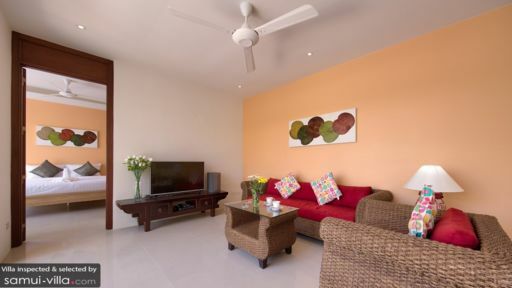 Here at Villa Lipa Talay Sawng, the living spaces are spacious, bright, and designed for your maximum comfort. With glass sliding doors that can be pushed aside for a better view of the pool, this open plan living area is one in which you can have enjoyable moments with your family. 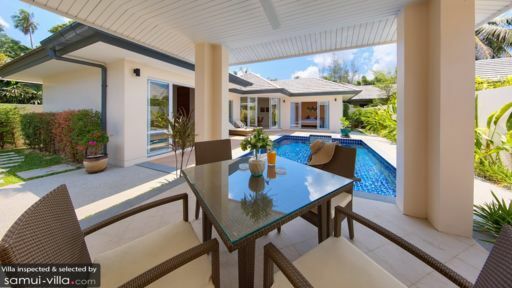 Grab a snack in the fully equipped kitchen, and enjoy it on one of the chairs by the four seater wooden dining table or on the vibrant cushioned rattan couch in the lounge area. You can also enjoy watching TV in this lounge area or gaze at the pool and garden beyond. The staff here at Villa Lipa Talay Sawng are friendly and will attend to your needs with the utmost care. Should you need itinerary or transport assistance, the guest manager will be happy to assist you. The housekeeping and security will ensure that you have a comfortable and safe stay. You also have the option to hire a private chef should you wish for someone to prepare your meals for you. If you ever want a relaxing massage, that can also be arranged. The staff here will really strive to make you as comfortable as possible so that you can enjoy your vacation with your family. What makes this villa a private beachside paradise is, not only is it located on the island of Koh Samui in Thailand, it’s only a few steps away from the white sand beach of Lipa Noi, which has 100 meters of shallow water and fewer crowds. It’s definitely a romantic spot from which to watch the sunrise or sunset as you sink your toes into the sand or go for a walk along the beach. However you want to enjoy the beach, there are lots of opportunities for you to do so. The area of Lipa Noi is a relatively untouched part of Koh Samui, providing guests some peace and quiet away from the hustle and bustle of busier areas. There are a few restaurants, bars, and cafés in the area but if you ever crave for some more nightlife, Chaweng is a 40 minute drive away while Lamai, with its shopping, dining, and beach, is a 20 minute drive from the villa. Samui’s centre, the town of Nathon, is a five minute drive away. If you want a relaxing holiday that’s away from the crowds, staying at Villa Lipa Talay Sawng might just be for you.